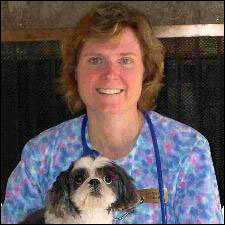 Dr. Marti Williams, a Southern California native, graduated from the University of California at Davis School of Veterinary Medicine (UC Davis) in 1987. She has a Bachelor of Science in Zoology, also from the University of California at Davis. She and her husband, John, who is also a doctor at Limestone Veterinary Hospital, owned a small animal veterinary hospital in a retirement community near Palm Springs, California. In 1999, following more than ten years of success operating their own practice and the arrival of James (a karate aficionado) and Katie (a pet enthusiast) they relocated to Hockessin, Delaware. Dr. Marti has developed multiple special interests within the field of small animal medicine while practicing in California and Delaware and as an emergency and critical care Veterinarian for three years. Her goal as a primary care Veterinarian is to provide the highest level of veterinary care for every patient, through the use of a thorough physical examination and history, and when necessary a thorough medical workup including such diagnostic procedures as blood work, radiographs, ultrasound, endoscopy, and surgery. While most of these procedures can be performed on an "in-house" basis, she also consults or refers to board certified specialists in our region. Marti and her husband John have been married for over 20 years. In addition to their two children, James and Katie, they also have two dogs; Ariel, a Giant Schnauzer, and Stella, a Pappillon. The Williams also have two orange tabby cats, Simon and Patrick. In addition to her family and pets, Marti enjoys in-line skating, skiing, karate, reading, and geo-caching.